Dr. Gilligan has recruited global experts to contribute articles on the topic of testes cancer. The issue is organized to mimic the clinical process of detection, treatment, and management. 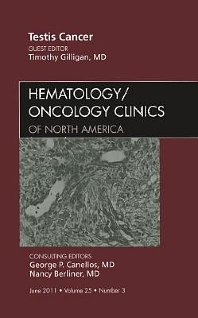 Included in the issue are articles on the biology, interpretation, and imaging of germ cell tumors; early stage and stage II of seminomas and nonseminomas; first, second, and third line of chemotherapy for disseminated germ cell tumors, resection of residual masses, and treatment of brain metastases.